Kingston & Knight Audit offers comprehensive services tailored to the requirements of clients seeking financial forensics Melbourne. Our extensive professional experience in the delivery of financial services is matched only by our investigative talents, allowing us to assist in litigation and legal disputes. As accredited auditors and experts in forensic accounting, our financial forensics Melbourne team apply their knowledge to the investigation and analysis of financial information. 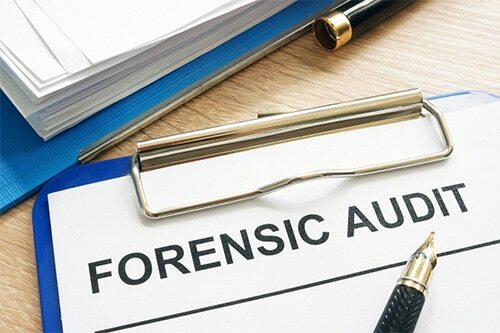 With qualifications in forensic accounting, the Kingston & Knight Audit team understand the requirements relating to usable forensic submissions and what constitutes quality evidence. Financial forensics Melbourne, forensic accounting, and forensic audit procedures are among the most important and specialised services offered by Kingston & Knight Audit. We understand the burden associated with engagement in litigation and/or legal disputes, yet we also understand the court process in a way that allows us to help guide you through it. Kingston & Knight Audit may contribute to your litigation or legal proceedings in a number of ways, perhaps first and foremost as forensic auditors/investigative auditors. In this section, we outline the nature of our services in the area of financial forensics Melbourne. Financial Forensics Melbourne – What is financial forensics? Generally speaking, financial forensics refers to the investigation, analysis, and reporting of financial information which may constitute usable evidence in litigation or other legal proceedings. Many terms are used to describe financial forensics and the financial forensics practitioners. For example, forensic accounting, forensic auditing, and financial forensics are often used interchangeably. Here at Kingston & Knight Audit, our team has extensive experience in investigative and forensic accounting services here in Melbourne. Backed by qualifications in investigative services, we apply this experience and knowledge to your case. As the scope of financial forensics as a field of practice is wide, so too is the selection of services we may provide in this area. Our forensic and investigative services are engaged to obtain usable, quality evidence from financial information and to act as an expert witness during proceedings. Though there are similarities between internal audit services and financial forensics Melbourne services, any forensic process requires special expertise and qualifications. At Kingston & Knight Audit, our qualifications and experience in forensic and investigative financial services enable us to apply our extensive command of best-practice audit and assurance processes to the outcome of legal proceedings. It is common requirement in litigation and legal disputes for a business valuation to be sought from an independent expert. Kingston & Knight Audit is able to perform the business valuation function as required in litigation and other kinds of legal proceedings, enabling a swifter ruling in many cases by timely provision of useful evidence. Our forensic business valuation reports are commonly sought in compulsory acquisition proceedings and family law proceedings. However, a forensic business valuation report may be sought as evidence in other forms of legal proceedings, and Kingston & Knight Audit is more than capable of performing the required valuation in a timely and disciplined manner. Stressful and draining for those concerned, family law proceedings and divorce proceedings require timely and effective forensic expert valuation reports to streamline the process. Kingston & Knight Audit stands by to assist in the identification of marital and family assets and liabilities. Our forensic expert valuation reports may also include a prepared balance sheet to be used for property settlement matters, as well as business valuations and other financial information required for family law and divorce proceedings. At Kingston & Knight Audit, our demonstrated skill in financial analysis and valuation enables us to prepare expert reports for compulsory acquisition proceedings. An expert report sought during such proceedings may require an assessment of business relocation costs or other costs relating to a compulsory acquisition. Our financial forensics Melbourne experts take a proactive approach to your requirements in compulsory acquisition proceedings. Depending on the client’s circumstances and requirements, Kingston & Knight Audit is able to assist further by preparing a compulsory acquisition claim and facilitating meetings and financial discussion with an acquiring authority relating to the acquisition. We may also participate in meetings with the opposition financial expert on request in order to expedite matters as considered appropriate by the client. The financial forensics Melbourne team at Kingston & Knight Audit can meet the requirement for financial expert reports in a wide range of disputes and legal proceedings. Regardless of the matter at hand, be it a commercial dispute or family dispute (e.g. an inheritance dispute), our communicative and compassionate team will prepare and submit the required expert reports for use in your litigation or legal proceedings. In the event that an entity becomes engaged in legal proceedings due to its financial management or activities, forensic audit services are usually required. The financial forensics Melbourne experts at Kingston & Knight Audit apply their insight into business information, economic theory, financial reporting practices, data management and analysis, and evidence gathering to assist in such cases. In civil proceedings, we may search for evidence to support a claim of financial misconduct, or alternatively to dispute such a claim. Generally speaking, the word forensic refers to something intended for use in court proceedings. This definition enables a solid understanding of our services as financial forensics Melbourne experts, as there are numerous ways these services may be applied to your real-world circumstances. Kingston & Knight Audit is proud to offer potential clients the opportunity to contact us for a free telephone consultation. If you are engaged in legal proceedings, or if legal proceedings are a prospect for you, we can assist you by explaining how our financial forensics Melbourne services are best able to support you within the legal system. Call the Kingston & Knight Audit financial forensics Melbourne team on (03) 9863 9779, or email us via audit@kingstonknight.com.au to find out more.